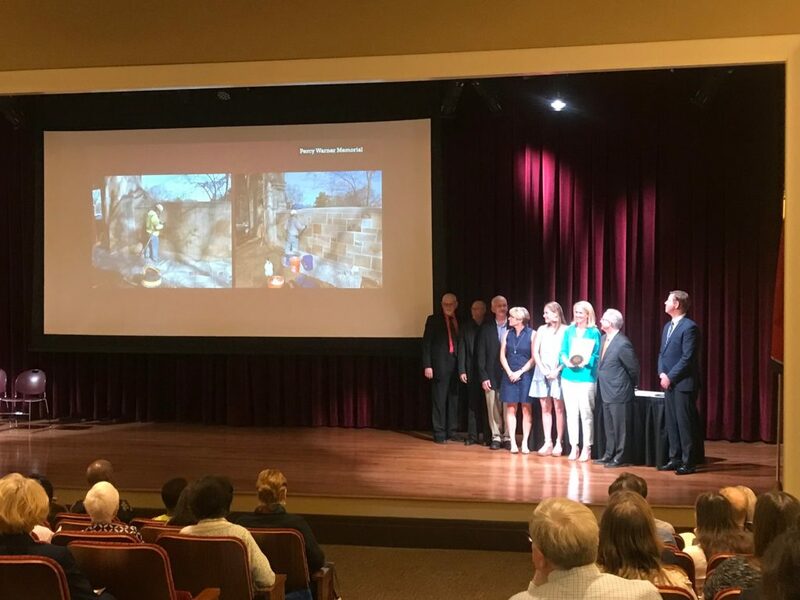 Friends of Warner Parks, Nashville historic preservationists and the greater Nashville community celebrate as the restoration efforts of the park’s beloved and iconic gates bring home award, recognition and praise. Covenant Capital Group Managing Partner Govan White and his wife Barby are proud supporters of the Friends of Warner Parks and provided the lead gift for the award-winning restoration of the Percy Warner Memorial Sandstone Entrance. Friends of Warner Parks is a nonprofit organization that works closely with the Metro Parks to preserve, protect and steward historic Warner Parks. Each year, the Metropolitan Historical Commission of Nashville honors various residential, monumental and commercial locations for their efforts in preserving Nashville’s rich history and architecture. The 43rd Annual Preservation Awards ceremony recognized the Friends of Warner Parks for their efforts in restoring and preserving the park’s historical entrance. Originally dedicated in April of 1932, the park’s entrance had deteriorated greatly after decades of weathering and harsh conditions. The Friends of Warner Parks undertook a campaign to stop the deterioration of the beautiful gates in 2017. With the help of the community and restoration specialists, the restoration of the park’s entrance is complete, and the iconic gates once again stand as a reminder of Nashville’s unique and long-standing history. An official ribbon cutting event will be held at the Percy Warner Park’s entrance on June 22 at 4 p.m.